At New York Kennedy Airport's airplane hangar, fewer than 30 pieces of steel linger from the debris recovered after the tragic 9/11 incident when terrorists hijacked planes and flew into the World Trade Center's twin towers back on Sept. 11, 2001. Even after 14 years, applications are still pending for these pieces of metal — most are for memorials and museum exhibits. Less than 70 other artifacts such as clothing or toys remain as well in Hangar 17 at Kennedy Airport. In August 1968, builders began using 200,000 tons of steel to construct the World Trade Center complex, just enough to raise the twin towers to incredible heights of 1,362 feet (south tower) and 1,368 feet (north tower). About 1.8 million tons of debris were removed from the site. Out of these, workers collected 840 pieces of steel, some were cut up to make a total of 2,200 separate items. They ranged from 6-inch slabs to the massive beams and to the 7.5 tons the Navy used to build the warship USS New York. The artifacts may be found anchoring memorials or the museum exhibits in 50 states and all eight countries: Germany, Canada, Brazil, South Korea, the United Kingdom, Afghanistan, China and Ireland. Not one piece of steel was recycled or discarded. Thirty applications are pending approval, still 40 others are in the review process. 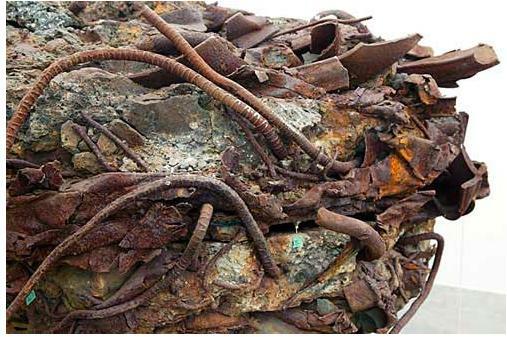 The Port Authority's mission was to preserve the artifacts and hand them out to worthy groups to commemorate the attacks.